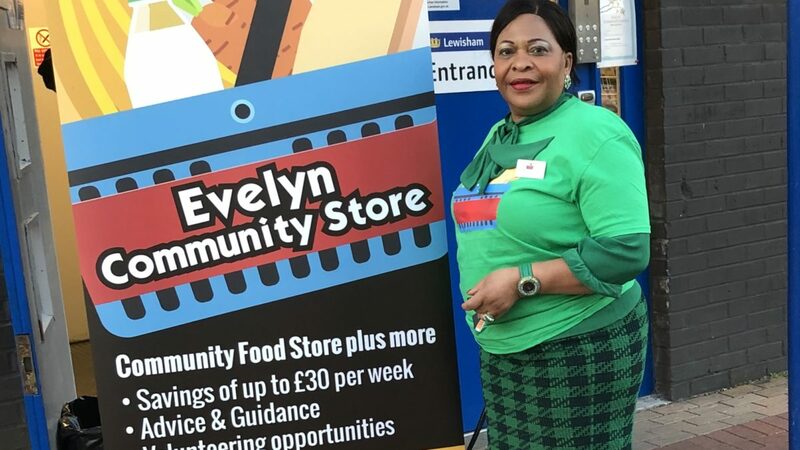 Cllr Caroline Kalu at the launch of Evelyn's Community Store. Based in the Evelyn Community Centre, the Store is a resident-led membership organisation which works with national charity FareShare. The Community Store pays a membership to FareShare who then collect good quality surplus food from supermarkets and redistributes it to the Community Store and other community groups. Residents on low incomes who struggle to pay bills sign up to become members of the Store. They pay £3.50 a week and in return are provided with fresh fruit and veg, frozen foods, tinned foods, meats, and household essentials. “It took a huge amount of work to put together and it wasn’t simple to get started. There are things which perhaps people don’t think about when they begin something like this. For example, all the volunteers had to receive training Health and Food Hygiene to an appropriate level. There is a false perception that the products from FareShare are past their best or inferior. This is not the case. It’s all high-quality healthy food. For those supermarkets like the Co-op who partner with FareShare it is a perfect way to minimise what would otherwise be wasted. We’re all very grateful to the companies which work with FareShare. The Store currently has fifteen resident volunteers who help the running of the shop when it is open, including cleaning the Store and accepting food deliveries. The Store is open every Tuesday evening for approved members at 5pm-7pm. How is your community tackling food poverty? Send us your stories to j.butler@party.coop. Register for our Local Government Conference featuring a masterclass with Pam Warhurst, Founder of Incredible Edible.